Opportunity!! Recent reduction to 2325.000? for a fast sale!! Price is NOT negotiable. 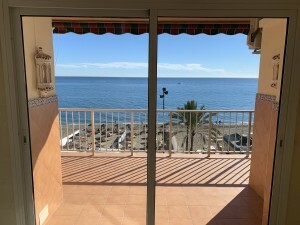 Beautiful Townhouse with large sunny terrace and sea views divided into 2 independent apartments located a short distance to the beach and services. Main apartment on one floor with entrance hall, spacious and bright living room with access to the large sunny terrace. Separate kitchen (will be renovated very soon) and equipped with sea views. 2 double bedrooms with fitted wardrobes and a recently renovated bathroom. Independent laundry room. Apartment for guests located below with separate access distributed in living room with open kitchen and exit to the community garden but for private use. A bedroom and a bathroom. Property in very good condition with double glazed windows, air conditioning hot and cold, fitted wardrobes and awnings. Beautiful community garden but privative use with fruit trees and a pergola to sit in the cool. Plot 98,46m2 plus communal garden. Total built size 178,76m2. Living area 138,11m2 (Semi basement floor 57,81m2 and ground floor 80,30m2) plus entrance porch 2,25m2 and uncovered terrace 38,40m2). IBI 260? per year. Community 11? per month. Year of construction 1968 (completely reformed). Supermarket, bars and restaurants 800 meters. La Cala de MIjas 4.5km.